RAID how does it work? What is RAID, why do you need it and why are the different RAID levels so important? RAID stands for redundant array of independent disks. It is a technique that was developed to provide speed, reliability and increased storage capacity using multiple disks rather than single disk solutions. So basically, RAID takes multiple hard drives and allows them to be used as one large hard drive with benefits depending on the level of RAID being used. As mentioned, RAID has several levels and each RAID level has its own characteristics. The one you should choose totally depends on whether you are using RAID for performance, fault tolerance or both. Here is a short explanation of the popular RAID levels. RAID 0 can be used to boost the performance of your dedicated server. It consists of striping without mirroring and parity. All data is written across multiple disks which means that the work of the server is handled by multiple disks instead of one. This will increase the performance of your dedicated server due to the fact that multiple drives are reading and writing data. The disadvantage is that there is no fault tolerance which means that the entire array will be affected if one disk fails and this can lead to data loss or corruption. With RAID 1 your data will be copied from one disk to another, creating a replica or mirror. Let’s say that you have a 10 GB file and you have a RAID 1 configuration, your file will be saved on the first and second drive. Your data will be available even when one disk gets fried, that’s why we can call this a safe or fault tolerance configuration. RAID 1 can be implemented through software and hardware. RAID 10 is a combination of both levels. (RAID 1 and 0) With this configuration, you can get fast performance and redundancy. It is perfect for heavy database machines or for machines that are performing many write operations. 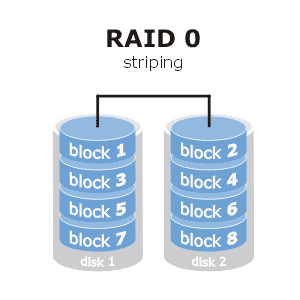 In order to configure your dedicated server in Raid 10, you need to have a machine with 4 disks. You can implement RAID 10 in both hardware and software but usually when you use software RAID 10 many of the performance advantages will be lost. RAID 5: Looking for something between? 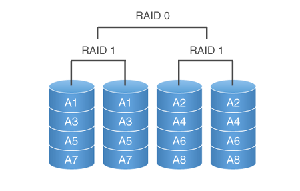 RAID 5 is a little bit complicated to explain but it is a solution between RAID 0 and RAID 1. RAID 5 can be implemented with 3 to 16 disks. However, for optimal redundancy, we do recommend a 3+1 configuration. With this configuration one disk is used for storing parity data for every 3 disks that are used in the RAID configuration. This configuration is just as safe as RAID 1. Unlike RAID 1 you will only use the capacity of one drive so for example if you have 3 disks you will only use 33% of the disk space and if you have 4 disks you will use 25% and so on. RAID 6 is similar to RAID level 5 but it allows extra fault tolerance. The parity data are written to two disks which means that it requires at least 4 disks. If two drives fail you will still have access to all of your data even when the failed drives are being replaced so we can call it more secure than a RAID 5 configuration. How many disk space can I use after the RAID configuration? This depends on the preferred RAID level. For example, RAID 1 uses the capacity of one of its drives to maintain fault tolerance. So if you combine 2x 500 GB drives in RAID 1, you will get 500 GB of usable disk space. With RAID 10 half the array capacity is used to maintain fault tolerance. If you combine 4x 500 GB drives in RAID 10, you will get 1000 Gb of usable disk space. When you’ve decided to create a website or to start a blog the first question that you are going to ask yourself is, which content management system you need to use. The most popular and widely used open source content management systems (CMS) are Drupal, Joomla, and WordPress. These content management systems are all based on PHP and MySQL but differ in functionalities. We’ve written a small comparison about these CMS platforms. Although choosing the right CMS totally depends on your goals and the desired functionalities for the website, the comparison below can still be very helpful to make your decision. Drupal is considered to be more complex than Joomla and WordPress because it requires more technical expertise. However, we can say that it is probably the most powerful CMS among all. You can use it for all types of websites from simple to very complex and advanced, Drupal fits for all. It has all the necessary features such as different templates and building tools to create an impressive website or blog. It is very secure and on average experiences, it has the least number of exploits and hacks. There are also a few disadvantages; the script is not user-friendly and it requires advanced knowledge to install and modify things. Another disadvantage is that the script can generate big server load if your website is too large. When it comes to ease of use, Joomla is easier compared to Drupal but it is more complex than WordPress. The installation process of Joomla is similar to Drupal. It takes only a few minutes and is ready to use right away. Just like Drupal this CMS can be used for any website from small and simple to large websites. Joomla has plenty of features to make all the necessary modules you need. Comparing to WordPress, Joomla allows you to build a website with more content and structure. It was designed to perform as a community platform and also has strong social networking features. On the other hand, there are also a few disadvantages; Joomla often makes websites heavy to load and run. The fact that some plugins only work with particular scripts can be considered as a disadvantage as well. WordPress is a better pick for beginners. It is really easy to use and it does not require PHP or HTML knowledge, unlike Drupal or Joomla. You will find thousands of plugins on the website and WordPress also offers lots of free and paid templates. You can also get great support from its community and find many tutorials to deploy simple websites. It is ideal for blogging and simple websites but not recommended for websites that require complex functionalities. Just like others, WordPress comes with a few disadvantages as well; the most important disadvantage in our opinion is that you are exposed to security vulnerabilities. Most plugins are also only usable for bloggers and not professional developers. When you do want to modify things it requires some PHP understanding as well. First things first; check the running processes on your dedicated server and kill the offensive processes. The problem could be a runway process so use “top”, “ps” or other monitoring tools to find the problems. When the problem is found use the “kill” command to end it. If your dedicated server runs too slow, you may be running scripts or databases that are very resource hungry. A reboot won’t solve this problem, you need to optimize otherwise the same issues will happen again. If your dedicated server is not running as it should be, there could be a security problem as well. So it is important that you run security checks in order to solve the issue. A reboot is not always the best option to choose because sometimes it aggravates things even more. If all these options did not solve the issue with your dedicated server, a reboot may be necessary. 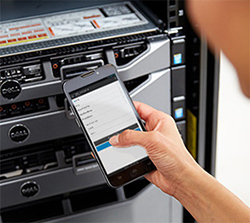 Bear in mind that you check the error logs and update your outdated software after the reboot because this might prevent the problem from occurring again.